As women enter a field, compensation tends to decline. Is the tech meritocracy a lie? Marie Hicks wants us to think about how gender and sexuality influence technological progress and why diversity might matter more in tech than in other fields. An assistant professor of history at the University of Wisconsin-Madison, Hicks studies the history of technological progress and the global computer revolution. 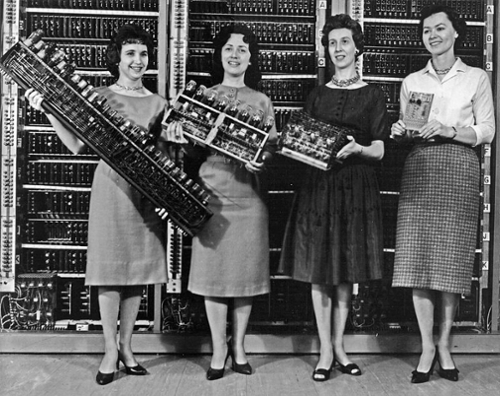 In Programmed Inequality: How Britain discarded women technologists and lost its edge in computing, Hicks discusses how Britain undermined its early success in computation after World War II by neglecting its trained technical workforce — at that time largely composed of women. We had a few questions for Hicks about what lessons Britain’s past mistakes might hold for the seemingly-unstoppable economic engine that is Silicon Valley today. 'Technical' used to be associated with low status, less-skilled work, but now tech jobs are seen as high-status. How did the term evolve? In the UK, the class system was such that touching a machine in any way, even if it was an office computer, was seen as lower-class. For a time, there was enormous resistance to doing anything technical by the white men who were in the apex position of society. Marie Hicks shares an illustrative example about a woman in a government IT center who trained men who were then promoted while she was demoted. Hicks's work highlights the endemic devaluation of professions once women enter. The US had less of that sort of built-in bias against technical work, but there was still the assumption that if you were working with a machine, the machine was doing most of the work. You were more of a tender or a minder—you were pushing buttons. The change resulted from a very intentional, concerted push from people inside these nascent fields to professionalize and raise the status of their jobs. All of these professional bodies that we have today, the IEEE and so on, were created in this period. They were helped along by the fact that this is difficult work, and there was a lot of call for it, leading to persistent shortages of people who could do the work. We’re in an interesting moment, when these professions are at their peak, and now we’re starting to see them decline in importance and remuneration. More and more, people are hired into jobs that are broken down in ways that require less skill or less training. New college hires are brought into them and the turnover is such that people no longer have the guarantee of a career. Will diversity initiatives, rather than elevating women, devalue the status of the field, as happened previously in professions like teaching and librarianship? We can see that already happening for certain subfields. Women are pushed into areas like quality assurance rather than what would be considered higher-level, more important, infrastructural engineering positions. The jobs require, in many cases, identical skills, and yet those subfields are paid less and have a lower status. The discrepancies are very much linked to the fact that there are a higher proportion of women doing the work. It’s a cycle: High pay and high status professions usually become more male-dominated. If that changes and more women enter the field, pay declines. The perception of the field changes, even if the work remains the same. Does the tech industry have a greater problem with structural inequality, or is the conversation just more visible? The really significant thing about tech is that it’s so powerful. It’s becoming the secondary branch of our government at this point. That’s why it’s so critical to look at lack of diversity in Silicon Valley. There’s just so much at stake in terms of who has the power to decide how we live, how we die, how we’re governed, just the entire shape of our lives. How do you suggest we tackle the problem? There’s this whole myth of meritocracy that attempts to solve the problem of diversity in STEM through the pipeline model — that, essentially, if we get enough white women and people of color into the beginning end of the pipeline, they’ll come out the other end as captains of industry who are in a position to make real changes in these fields. Top down. Supplementing the workforce from the bottom hasn't led to more diversification, says Marie Hicks. To fix the leaky pipeline, change needs to start at the top. But, of course, what happens is that they just leak out of the pipeline, because stuffing more and more people into a discriminatory system in an attempt to fix it doesn’t work. If you want more women and people of color in management, you have to hire them into those higher positions. You have to get people to make lateral moves from other industries. You have to promote people rather than saying, “Oh, you come in at the bottom level, and you somehow prove yourself.” It’s not going to be possible to get people to the top in that way. What we’ve seen is decades and decades where people have been kept at the bottom after they come in at the bottom. We have to have a real disruption in how we think about these jobs and how we hire for them. We can’t just do the same old thing but try to add more women and more people of color into the mix.